Severe weather will be possible for a good portion of Texas including all of SE Texas on both Saturday and Sunday. Heavy rainfall will be possible both days. This is a good weekend to stay weather aware and have multiple ways to get warnings. Two storm systems will move across Texas over the weekend – one each day. The overall weather pattern will support thunderstorm activity both days with severe weather and heavy rainfall possible. Here is a quick break down for each day. 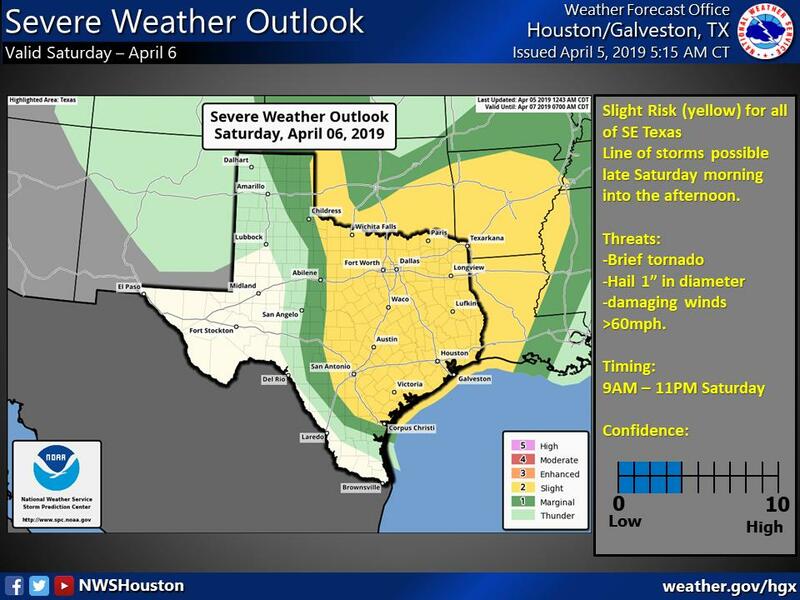 Saturday – threats will be a brief tornado, hail and damaging winds as a line of storms possibly moves across the northern half of SE Texas. Timing – generally 10AM to 6PM. Location – along and north of a Columbus – Tomball – Livingston line. Rainfall amounts – generally 1-2 inches with rain rates around 1″ an hour. 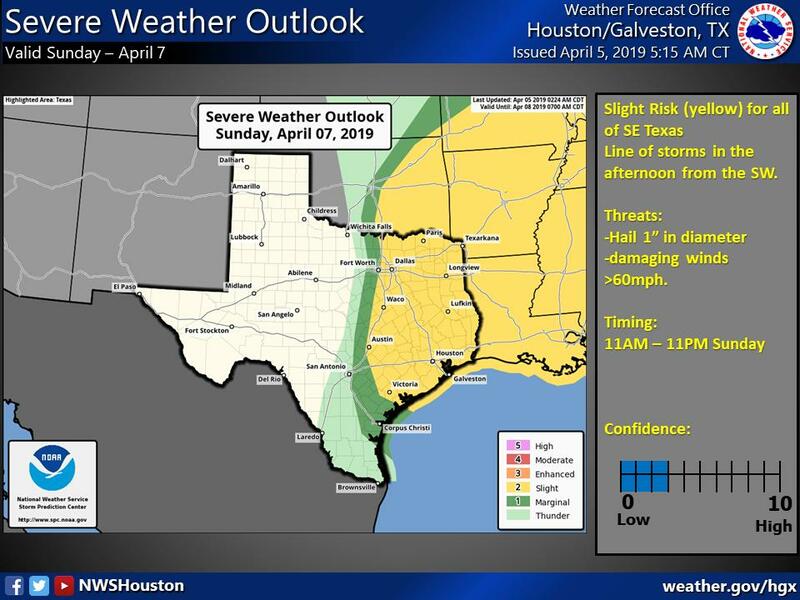 Sunday – threats will be hail and damaging winds with a cluster of storms moving from SW to NE across much of SE Texas. Timing – generally 12PM to 9PM. Another 1-2 inches of rainfall possible but potential for isolated higher amounts. 2 Day forecasted rainfall amounts of 2-4″ with the potential for higher amounts any of these days. Confidence – Confident that the weather pattern will support severe weather and heavy rainfall but exactly details of location and timing will continue to change. Several forecast parameters could change on very small time and space scales. – Drive with caution. Car may flood in low-lying areas. Ponding on roadways may increase risk of hydroplaning. – Pay attention to the weather. 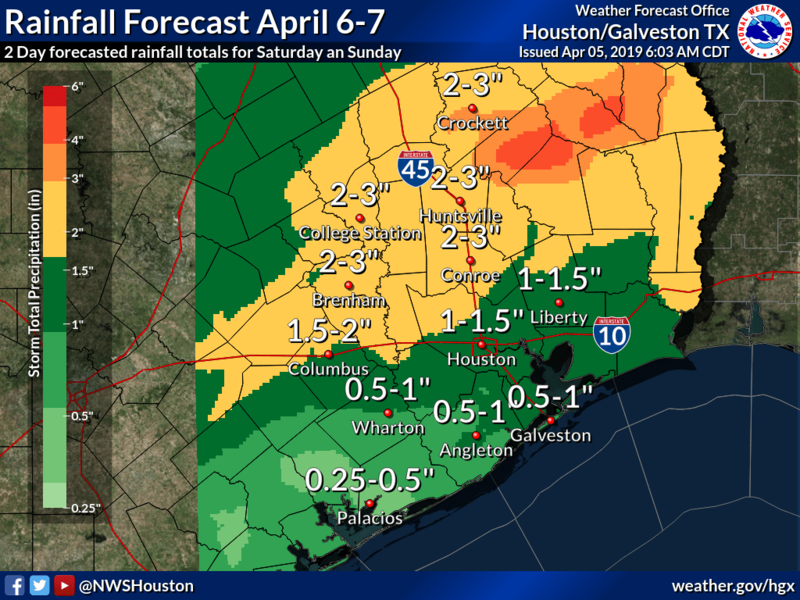 Monitor the NWS, your local media, HCFCD and other official weather information sources. – Rain may move repeatedly across the same area, causing a rapid rise on creeks and bayous. However, creeks and bayous are not likely to exceed their banks.